The image of the city streetcar hearkens to another era — before the rise of the automobile led to the congested commutes we suffer today. But what if the streetcar made a comeback in Los Angeles? Wouldn't that be neat? Downtown developers think so. But many transit advocates say it's a waste of limited resources. And most Angelenos don't seem to care. Given how many delays and shortfalls the project faces, they may be right not to. Starting around Civic Center at 1st Street, the planned route would send the line down Broadway south to 11th Street, then turn west past Staples Center and LA Live. The line would turn north again on Figueroa Street, east along 7th Street, past the Metro stop, turn up Hill Street and back to Civic Center on 1st. That works out to about a 3.8 mile round trip with 23 planned stops. There's also an option to extend the track up to Grand Avenue for stops at the Walt Disney Concert Hall and nearby museums. It'll be beset by the same problems that killed the original streetcar. It would run down the middle of the road and nothing would separate it from cars, meaning its operator would have to deal with traffic like everyone else. The latest study estimates it would top out at 6 miles per hour during rush hour. That's up from the previous study, which predicted 3 ½ mph. Projected ridership is 4,000 passengers a day, potentially closer to 6,000 in later years. Then there's the cost. 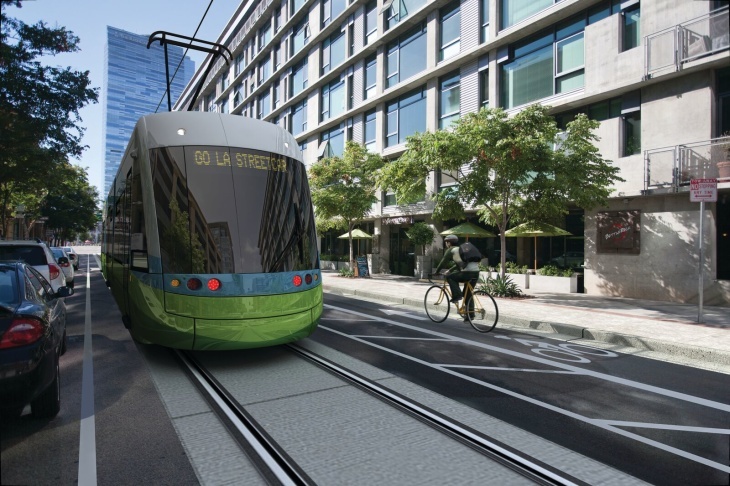 According to the latest environmental assessment for the downtown L.A. streetcar released by the city last week, the project will cost about $290 million and could be open for business by 2021 — if there were actually money to build it now. Well, there is some money. 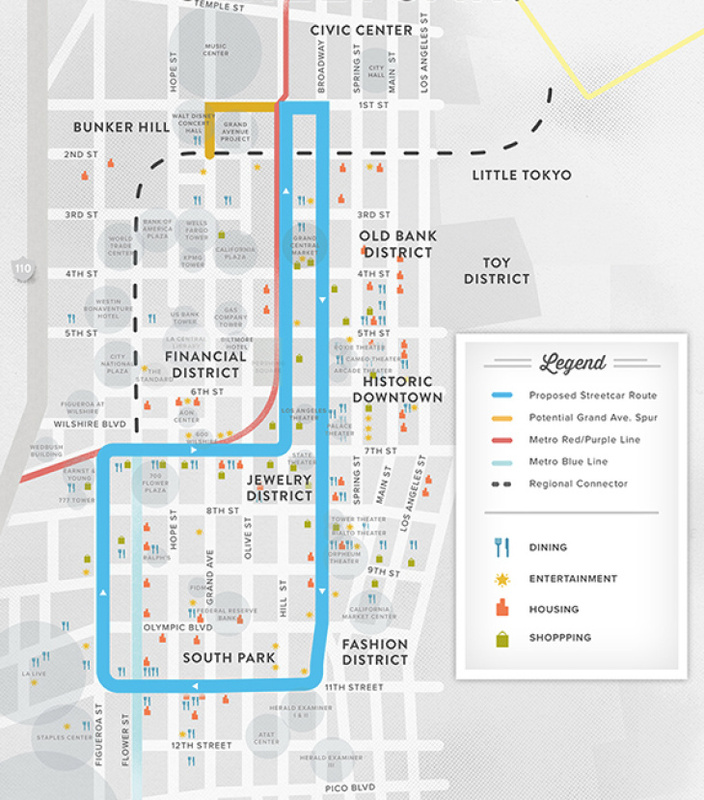 In 2012, downtown property owners voted to approve a tax district there to raise $85 million for the streetcar. That amount would have gone a lot further if the project had stuck to the originally estimated budget of $125 million. But since environmental and design assessments have moved forward, the budget has more than doubled to the current $290 million figure, which doesn't include a spur to Grand Avenue that backers hope to add for an additional $16 million. The streetcar has an allocation of $200 million from Measure M, the half-cent sales tax approved by county voters in 2016 to fund transportation projects. But it is dead last on the list of dozens of projects to be funded with that revenue, so it's not slated to break ground until 2053, with a completion in 2057. Backers have held out hope that it might be accelerated with help from the federal government, but funding for urban transit has been in even shorter supply under the Trump administration. Even funding for clearly transformative projects with high ridership projections, like the Purple Line subway to Westwood, has been called into question. Budgets proposed by the Trump administration and passed by the House of Representatives have slashed or eliminated funding streams for urban transit projects. The spending bill that was ultimately passed this year restored funding for the Purple Line, but Trump's Federal Transit Administration has yet to release the money. So why have city officials been pushing so hard for this? Because developers and investors love streetcars. A lot of cities and developers were paying attention when Portland, Ore. brought back its streetcar in 2001, fueling a revitalization downtown. 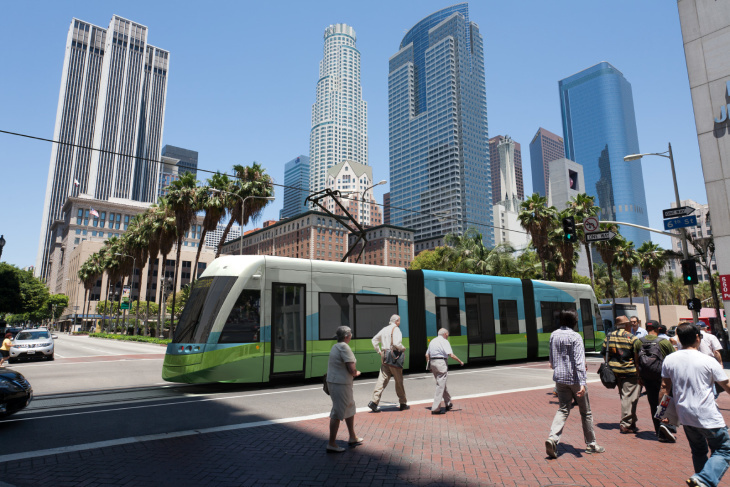 City Councilman José Huizar, who represents the downtown area, may be the streetcar's biggest advocate. He sees it as a key to revitalizing Broadway and the rest of downtown L.A., like Portland's streetcar did there. But L.A. is not Portland. And our downtown has been on the upswing in recent years, with seemingly no problems attracting development. The rash in new streetcars nationwide hasn't been super successful. Cities like Atlanta and Detroit put the lines in the road and haven't reaped much in ridership. Given these facts, critics argue that the streetcars primarily serve developers in their mission to generate profit for themselves — and taxpayers shouldn't have to foot the bill for that.